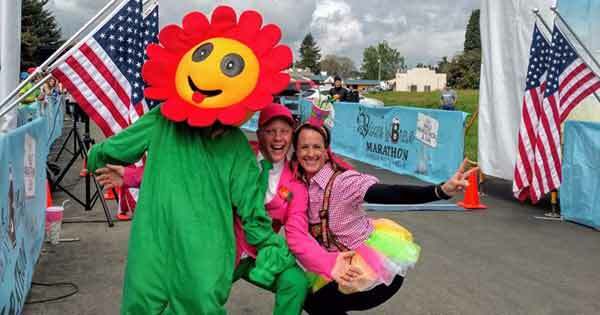 Blooms to Brews Run and Fun | Clark County Live! The Blooms to Brews Marathon, Marathon Relay, Half Marathon, 10k and 5k Run/Walk takes place in one of the most historic communities in Washington State — the Woodland bottoms farm country. This is the 5th year for this fun springtime run, and it’s going to be a “Royal Celebration”. The Blooms to Brews Marathon is one of the flattest and most scenic USATF certified marathons in the country and is a Boston qualifier. But Blooms to Brews offers a race distance for almost everyone, including the Marathon Relay. “Marathon running can be a team sport! Gather your friends, co-workers, or family members to form a 4-person team, with each member running approximately 6.5 miles. We only have room for 100 teams to participate, so sign up early to ensure your team’s spot in this awesome and fun event.” Every team member will run a 6.5 mile leg, and buses will trek team members to each relay connection point. Which means you don’t have to worry about transportation. The Post-Party will be held at Horseshoe Lake Park. Food, live DJ from All-Star Music, and a beer or root beer are included in your registration. As part of their 5 year “Royal Celebration”, all ladies will receive a tiara at the finish line. For spectators, beer and food will be available for purchase, so meet your friends and loved ones at the finish line and join the fun. The Blooms to Brews Marathon is a non-profit organization that serves the community by providing a world class marathon and related fun events that raise money to benefit local charities, while promoting health and fitness. The funds raised will go to PKU Northwest to be used as scholarships for camp. Blooms to Brews will take place on Sunday, April 28, 2019. For more information and registration, visit Blooms to Brews online. Don’t forget to get a photo with the Bold Babes or the Race Director in his fun suit that seems to keep changing every year!